Mushroom Masters: A Tournament of Taste is back for year two! I was delighted to be asked to participate again after having so much fun with my Portabella Pizza recipe last year. Things got wild. Last year’s challenge is a big reason why I now love (and crave!) mushrooms as much as I do. I really didn’t fall in love with mushrooms until I started experimenting with them in the kitchen. Sometimes those strange little things just need to grow on you like…fungi…? Mushrooms are the only item in the produce aisle with vitamin D. Winter’s coming, eat up! Mushrooms are low in calories, fat free, and can be an effective substitute for meats thanks to their hearty and fulfilling nature. I would concur. Mushrooms are a source of selenium and ergothionene, antioxidants that play a role in immunity. Don’t be a sicky this Winter and eat up. Mushrooms are a kitchen staple: they can star as the feature ingredient, or pair with any dish. They are like a little black dress, in other words. Tastespotting is hosting the event once again along with Mushrooms Canada, Australian Mushroom Growers Association, and The Mushroom Council. Twelve of us food bloggers from Canada, US, and Australia were asked to compete in this challenge and were offered a bit of compensation for our time and food costs. We are now in the 4th and final week of the challenge. I was assigned to the final week’s Appetizer challenge! Also participating in this appetizer challenge are two very talented bloggers- Elana of Elana’s Pantry and Ellie of Kitchen Wench. 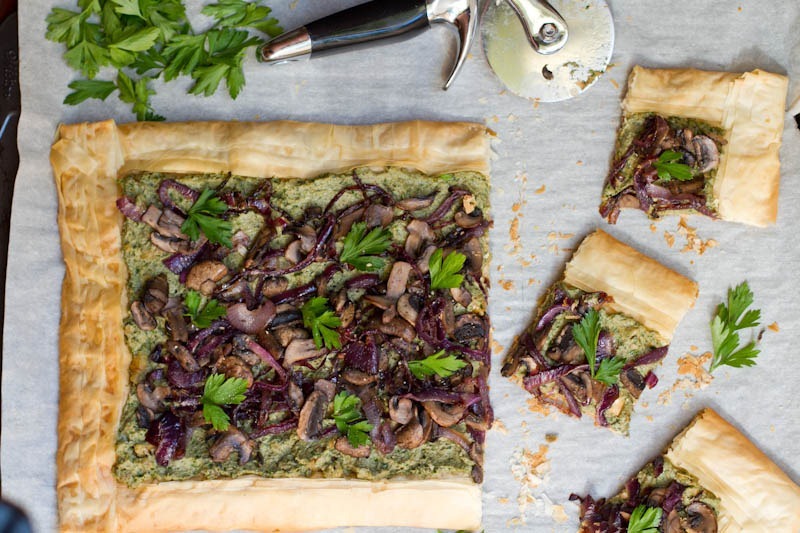 To be honest, I thought my mushroom creativity was maxed out with last year’s Portabella Pizza, but this Mushroom Walnut Pesto Tart is hands down the best mushroom recipe I’ve ever made. I’m so excited to share it with you after sitting on the recipe for a few weeks. Given my recent infatuation for vegetables in my pesto, I thought it would be fun to make a mushroom walnut parsley pesto as a base for a tart. I really had no idea how it would turn out so I prayed to the culinary gods for a miracle. For the pesto, I processed together garlic, toasted walnuts, extra virgin olive oil, fresh parsley, S & P, and the sautéed mushrooms. I was a bit worried that the mushrooms would taste weird in a pesto (shame on me, I know), but the flavours just worked so well. If you don’t want to make a tart you can always use this pesto with a pasta dish or spread over some crostini. Or you know, the spoon to face method worked for me quite well. Step aside roasted tomato basil pesto, there’s a new fav pesto in town. 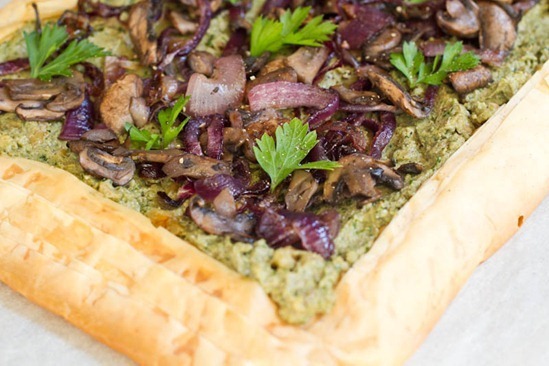 My award-winning pesto tart took home first-prize in a Mushroom Canada competition a few years ago. It takes a bit of time to prepare, but the wait is worth it once you sink your teeth into your first crispy, savory bite. 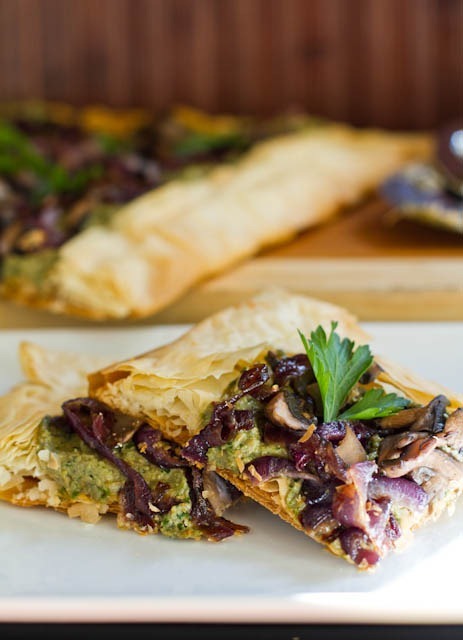 If you don’t want to make a phyllo tart you can simply spread the pesto onto crostini or try tossing the pesto with pasta and sauteed mushrooms for an elegant dinner. Preheat oven to 350°F. Line a large baking sheet with parchment paper. Thaw Phyllo dough according to package directions. In a large skillet, sauté the sliced red onion in 2 tbsp olive oil over medium-low heat. Stir often for about 30 minutes. In another skillet, sauté the sliced mushrooms in 1-2 tsp olive oil for about 20 minutes or until the water cooks out. With the food processor running, drop 2 peeled garlic cloves in and process until chopped. Add in 1 cup (saving the rest for the tart) sautéed mushrooms, olive oil, and water and process until smooth, scraping down the sides as necessary. 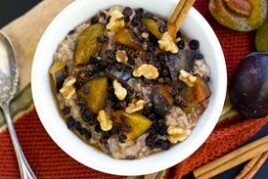 Now add in the rest of the ingredients (using only 1/3 cup walnuts) and process until smooth. Stir in remaining 1/3 cup walnuts. Adjust seasonings to taste. Place 1 sheet of Phyllo dough onto prepared baking sheet. Brush or spray on oil. Repeat for 7 layers. Carefully fold each side inward to form a crust. 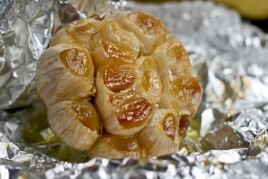 With a fork, poke lots of holes all over the phyllo to allow air to escape. You can also weigh it down with pie weights. Bake at 350°F for about 18-20 mins until golden. After cooling the phyllo for 5 mins, carefully spread on all of the pesto, top with the remaining mushrooms and onion. Garnish with fresh parsley leaves. Cut into squares and serve immediately. Oh my goodness Angela, I don’t know how you come up such yummy recipes and get me to drool all the time even when I am not hungry. This looks so good, and your photography is superb. Seriously, if you decide to publish a cookbook I will be first in line. Gonna visit Tastespotting. 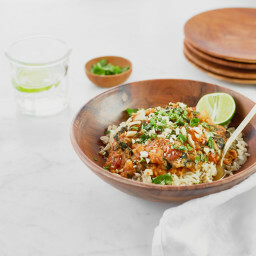 Saw another one of your recipes on an Australian website. Oh my gosh this looks divine. I’m inspired to use the leftover mushrooms in the fridge now for dinner somehow tonight. Oh my goodness Ange, this is beautiful! You’ve got my vote for sure. Mushrooms AND pesto?? Absolute heaven! And the photos make it look even better. Good luck with the challenge! Looks incredible. LOVE the header!!! wow that is one beautiful dish. the colors are mouth watering! looks great. hope you had a great weekend! This looks delicious! I definitely need to start eating more mushrooms in the form of this! Whoa! I have some artichoke pesto I made and puff pastry in my fridge as we speak!! This looks amazing!! This looks good! I am a recent lover of mushrooms (I actually crave them). As a child the texture eeked me out (lots). Also, I like your fall header. Thanks for highlightiing the benefits of mushrooms! I will try to eat more of them… especially if they help with immunity! That tart looks totally rustic and fab! Ohh I never knew they had vitamin D! Now when I eat my omelets with shroomies I know I’m getting a double dose of Vitamin D which is so necessary living in such a northern state. I don’t think mushrooms have vitamin D unless they are specifically placed in the sun to absorb it. I could be wrong, though. Man #1: You know what my favorite vegetable is? Man #3: Mushrooms, because I’m such a fun guy. Not sure about the Vitamin D thing- that was info I got from the mushroom council. Looks so yummy. 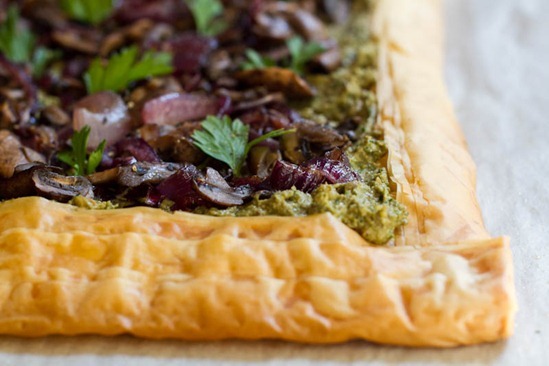 Love puff pastry tarts, and with pesto, and mushroom pesto at that!! I just went to the competition site and they’ve made a mistake though :( It says ” Canada’s Angela at Oh She Glows shows a Mushroom and Caramelized Onion Tacos” That should be tart not tacos right? hehe yea I saw that too. I will email them. 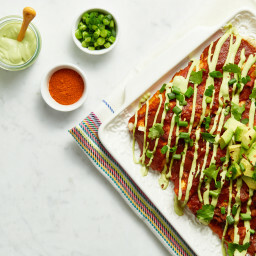 This recipe is GORGEOUS!!! Girl, you always have my vote :) Love your recipes and lovin’ over here!! I used to despise mushrooms, but now they’re tolerable. Sometimes the texture gets me, but with vitamin D and these New England winters I should get eating! The pesto looks delectable. I love mushrooms so much I like to roast them and eat them plain with a little balsamic vinegar and salt and pepper. Strange, I know. This recipe looks awesome. I never would have thought that mushrooms could go in a pesto! i love eating them that way too! Sometimes I just sautee them with herbamare and pepper until crisp and eat up. So good. 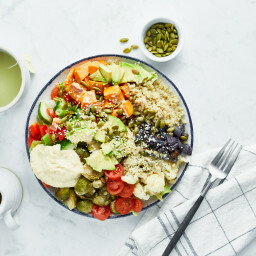 This looks absolutely delicious, I can’t wait to try it! Yours has 92% of the votes!! I looooove that you’re in the lead with 92 % Angela! I obv voted :) Clearly nothing beats this recipe, it’s amazing, in tart form! I love the pesto kick you’re on too, I just wish my poor little basil plant could keep up with the demand. Looks Amazing!!! I wish I could reach out and grab a slice! You’ve got my vote! Congrats on being asked to do this by Tastespotting. What an honor! I met Elena at my most recent food/photography workshop and she is a total sweetheart! Your recipe and pics are gorgeous! This looks crazy delicious– and I love the header!! Is that new?! I feel like every time I come to your blog, it looks even better than the time before! Thanks Anna. Yup it’s new for Fall. :) I’m just changing them up for the seasons lately. I’ve been craving mushrooms recently – I think you’re right that they have a meaty texture & flavor. This looks delicious! Oh my. I think I could impress my friends with this! It’s chanterelle picking season here, so a mushroom tart is certainly due. Oh my gosh that looks sooo mouthwatering!!! I went and voted for this beautiful recipe (good luck!) but ont he website the first time it refers to each recipe it calls yours tacos? Then later it says tart. Strange! Mmmm yum! I didn’t love mushrooms until I started experimenting with them, too. It was one of those things I hated growing up but learned to love! :) That tart looks really good! I need to get experimental with pesto as well. We all know you will win!! That looks and sounds so delicious, what a good idea! Good luck! This looks wonderful! I love mushrooms, but I don’t cook with them enough. Thanks for the inspiration! That looks so good and fancy. Perfect for impressing someone. Best of luck. Love you new autumn header!! That looks so pretty and delicious! Mmm…I love mushrooms. Hate parsley though. Maybe I’ll try this with some thyme and rosemary instead because this looks awesome! I LOVE MUSHROOMS! 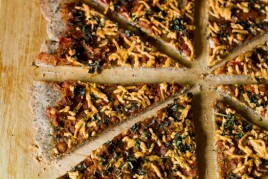 that crust looks so flakey and delish! Mmm. This looks so amazing! Best of luck, Angela! Mushrooms get such a bad rap! I think they’re delicious! Good luck in the challenge! it looks so yummy!! I just voted and you’re in the lead! Woohoo! Looks amazing! I just popped over the link and voted and couldn’t help notice that you’re winning! I’m going to go vote but I just wanted to say that this looks delicious! And I had no idea that mushrooms had vitamin D. That’s pretty cool. I voted for you! Your tart looks so good, but I wish I liked mushrooms. I ty so hard to like them, but I can’t! If there in my food I won’t pick them off, but I won’t go out of my way to eat them! Good luck on the contest!! I am such a mushroom fan, and this looks phenomenal. Trying it out this coming weekend. SUPER beautiful and amazing! We had some type of veggie filo for our wedding nearly 15 years ago. My family catered our all vegan wedding and was so happy with the look and subtle elegance of the flaky dough. Whats the best mushroom to use for this recipe? Portobello? Button? your recipes make eating healthy food so fun! i always look forward to cooking meals at home now! Soo where’s the recipe? Lol. I’m tryna make this! 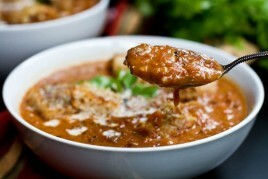 Hey Dee, It’s linked in the post on Tastespotting. Sorry its a bit confusing! I made the mushrooms and the pesto from the recipe in the Oh She Glows cookbook and served on crostini. The mushrooms were good — but the pesto was AMAZING. I think it might be the single most delicious dip/spread type thing I have ever made, with incredible depth of flavor and savoriness. Thank you! This was amazing! I made it as part of Thanksgiving and it was super delicious. Even the omnivores couldn’t stop eating it. 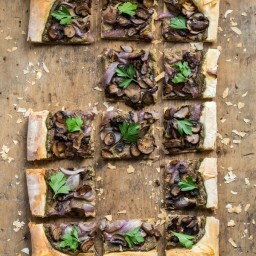 Hi, I wanted to this mushroom tart recipe in the cookbook as it looks wonderful but wondered if I could fully prepare it and then let it sit in fridge for a few hours before heating and eating. 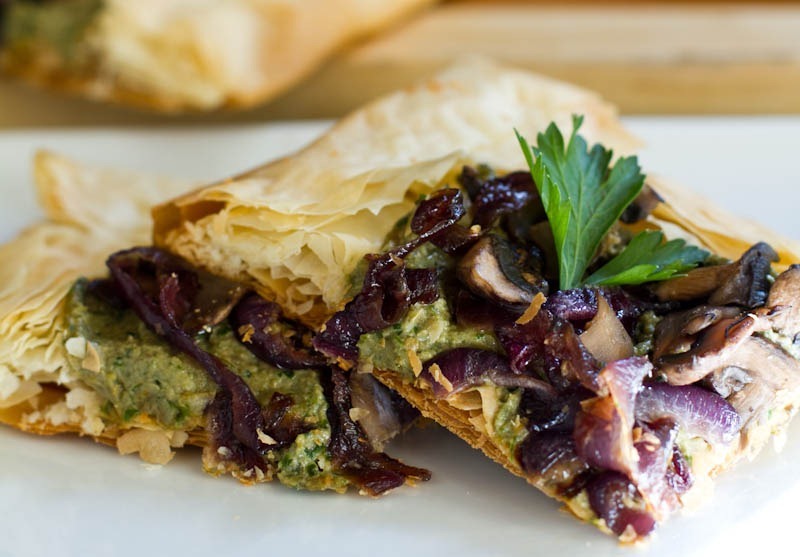 Or would that mess up the phyllo? I am looking at making this as part of a hors d’oeuvre selection for Christmas, and am wondering if it can be made in advance, or partially in advance? Do you think I could replace the parsley in the pesto with basil? I have fresh basil at home already and love it, but I wonder if the tastes would work well together..? Hey there! Is this tart ment to be served warm or cold? Im thinking about bringing it to a friends for dinner and prebaking the phylo at home and adding the mushroom pesto a few hours later before serving. Would this work? Thanks! I am confused. This is different than the recipe in your cookbook. The book says to cook all the ingredients together for 26-32 minutes. This version says top and serve without cooking the toppings. Which way works best? Thanks! You can’t go wrong with pesto! This appetizer looks amazing! This looks so good! Wonder if you could use a flat bread or pizza crust? Hey Marcia, I haven’t tried it myself, but this sounds so delicious! I can’t see why it wouldn’t taste great. :) Please let me know if you try anything out. This looks amazing! I am an avid mushroom lover. My mom……. not so much. Do you have any recommendations to substitute the mushrooms for this one? Eggplant perhaps? Hmm that’s tough since the majority of the recipe is made up of mushrooms. I will put my thinking cap on and let you know if I think of anything! Worth every minute of the prep work. It was time consuming to make, but incredibly delicious. I served it to non vegan guests and they were raving about it the whole evening. Tara, I love how many recipes you’ve been making! Nice work. I’m thrilled everyone loved this tart! This was such a wonderful addition to our Thanksgiving dinner! This was my first time working with phyllo dough, and I had so much fun with it. The mushroom pesto would be delicious spread on toast or your great chia bread. Thanks so much for posting and including in your cookbook! Very labor intensive. Didn’t like the pesto at all. Aw, I’m so sorry to hear that Angela! I made it a couple of time and it is just wonderful. Wondering if I can use cauliflower pizza base instead of the phyllo dough?